When I was in my last year of law school I took Securities Law. The instructor was a partner from McCarthy Tetrault who mentioned in a lecture that they were lucky to have noticed a legislative change that affected one of their deals. That moment made me think: how do lawyers find out about new laws? Investigating that made me realize that there wasn't a software system for notifying people about changes to laws. So I created one. 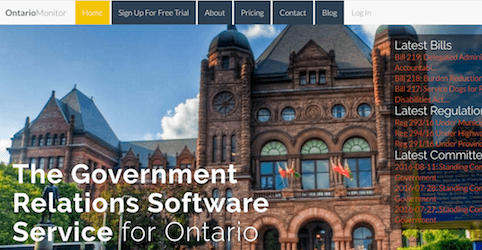 I currently run two services for monitoring the Ontario and federal legislatures (and associated regulatory systems): www.ontariomonitor.ca and www.federalmonitor.ca. 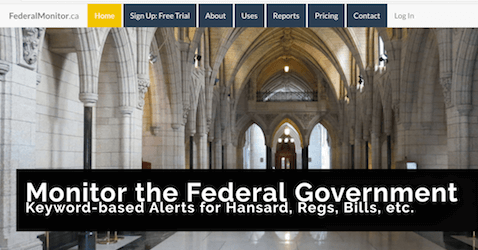 These services provide email alerts whenever client keywords are mentioned in new laws, regulations, Hansard speeches, etc. Understanding how laws are made and the different kinds of rules was essential to being able to develop these legislative monitoring services. A few weeks after becoming a licensed lawyer in Ontario I set up my own law practice. Knowing that no one would refer work to me (a newly minted lawyer), I needed to find customers. How does a lawyer find customers? When I ran my computer programming business I found a couple clients on Craigslist but that's not a good place to advertise legal services. So I set out to make my own service to advertise my own services by creating www.flatlaw.ca. FlatLaw.ca is a website where lawyers can post their fixed rate legal services. I created the platform to help drive business to my own law practice but it ended up being a service used by 75 lawyers (so far) that's helped many people to find an appropriate lawyer. When I founded FlatLaw.ca in August of 2013, there was no other service like it in Canada or the US. Knowing the types of services lawyers offer and understanding the market was what enabled me to take FlatLaw.ca from an idea to a platform serving thousands of Canadians. A few years after law school I was contacted by an Israeli-licensed lawyer in the process of completing his PhD at Osgoode: Nachshon Goltz. Mr. Goltz and I spoke about our shared interest in creating tools for making the law more accessible. Our first conversation over coffee led to the idea of creating www.global-regulation.com, a site that is now the world's most comprehensive search engine for global law. We set out to create a “Babylon for laws” and ended up making what our customers refer to as the “Google of regulation”. Global-Regulation.com uses machine translation to make over half a million foreign laws available in English and make it far easier to find English-language laws through a cloud-based search engine. My background as a lawyer, and classes I took in law school on legal research, were instrumental in being able to develop global-regulation.com. Someone who was just a software developer would have had a very hard time understanding what aspects of laws are important and how to transform millions of laws into a useful search product. Having a foot in both the development side and the legal side is very useful for creating what are now called “legaltech” solutions. When I was in law school legaltech wasn't a term I heard anyone use. I'm glad that there's a lot more opportunity for combining law and technology today. For any law students reading this and interested in learning more: I recommend looking up "LegalX" (Aron Solomon and Jason Moyse of MaRS) and "LIZ" (affiliated with Ryerson University).